While Nokia Malaysia has initially stated that the Portico updates for Nokia Lumia Windows Phone 8 owners will only arrived later this month and offered manual update for customer to accelerate the process, it seems that things have turned for the better. The outfit yesterday has announced that the update has been pushed to Nokia Lumia 920 through over-the-air (OTA) starting immediately. As the update is operator dependent and is being delivered by batches, some users might receive it much faster than others. Lumia 920 owners that have received the updates should able to see that their device’s firmware revision number have changed to 1232.5951.1249.1007 (dubbed as PR 1.1) or 1232.5951.1308.0008 (PR 1.15). 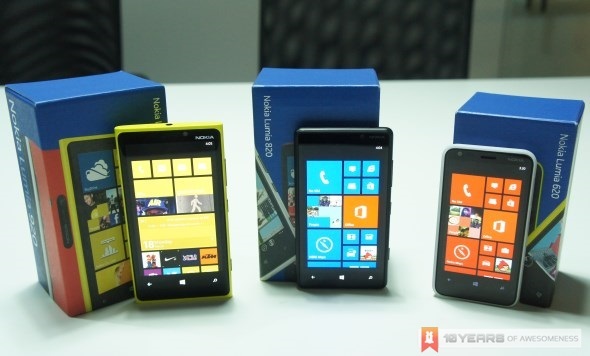 Meanwhile, Lumia 820 and Lumia 620 owners will also receive updates for their devices via OTA beginning from 4 April. These updates are said to be able to provide improvements to all three devices in terms of areas such as messaging, camera, stability and overall performance although some users have reported several problems associated with them such as GPS and connectivity issue.